Christopher L. Webber » Blog Archive » Drill, baby, drill! In Washington they are talking about “economic stimulus,” but stimulation in these parts comes every February when a run of warm days signals the start of the syrup season. All you need is a brace and bit to drill holes, spigots to set into the holes, buckets to hang from the taps, and a stove and a pan, and you’re in business. They also talk about energy independence. Yes. The suggestion was seriously made in the early nineteenth century that maple sugar production should be increased to reduce our dependence on slave-produced cane sugar. Why should we depend on Canada for our syrup when we can produce it right here at home. What if the Canadians got upset with us (not hard to imagine!) and closed the border. Folks in Vermont wouldn’t care – fact is, they’d thrive on it. But the price per gallon would zoom out of sight. People got upset last year when the price of gas went above $4 a gallon. The price of maple syrup is already between $60 and $75 a gallon and Washington doesn’t seem to care. Why isn’t there a national program to increase our domestic production? Why aren’t we putting money for maple syrup in the latest bail out bill? I’m doing my part, but there are millions of untapped maple trees out there. Drill, baby, drill! I love this picture. 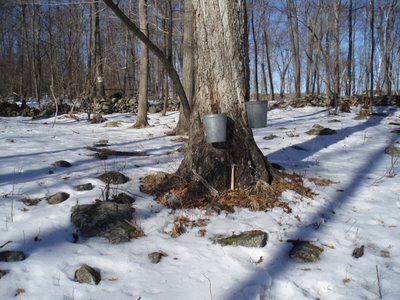 Brings back fond memories of doing some maple sap harvesting in Burlington, CT, many years ago! The most amazing thing to me was how many buckets and buckets of thin watery sap must be collected to result in the finished maple syrup. The harvest is great, but the workers are few. Drill, Chris, drill! And enjoy the fruit of your labor!